Services by private Air-conditioned car, sightseeing in Varanasi with English speaking local guide/Translator for the sightseeing, Early Morning boat ride at Ganges, Lunch at a Restaurant in Varanasi)ENTRY FEE, TIPS, AND PERSONEL EXPENSES. 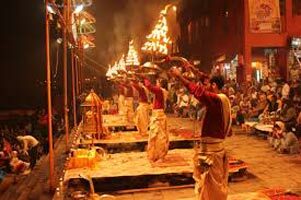 Varanasi An Holy City of Hindus a Visitor Can Witness First-hand the Ancient Hindu Ritual of Cremation. the City of Varanasi is Quite Old, with Narrow Streets, One Day Trip of Varanasi with An Early Morning Boat Ride Starting Around 5 am in Summer and 6 am in Winter. Boat Ride At the Ganges for Sunrise in this Holy is a Great Experience. Observe the Natives Performing Their Daily Activities Alongside River Ganga. Watch People Performing Various Rituals and Witness the Grand Aarti On the Ghats. World is Different Here Kind of People Who Visit Ghats Early Morning are Doing So for Decades. Early Morning Light is Particularly Inspiring, and all the Color and Clamor of Pilgrims Bathing and Performing Puja Unfolds Before You. after Breakfast At Hotel, Visit the Benares Hindu University, Bharat Kala Bhawan, New Kashi Vishwanath Temple, Durga Temple and Indian Art Museum. afternoon, An Excursion to Sarnath, The Place Where Lord Buddha Gave His First Lecture After Attaining Enlightenment in Deer Park. Besides Buddhism, Sarnath is also Connected with Jainism.